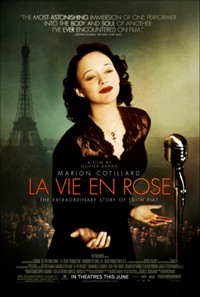 La vie en rose (2007), a film directed by Olivier Dahan, recounts the life story of French popular music legend Edith Piaf, née Edith Giovanna Gassion. I hereby confess that I knew nothing about this woman's life before viewing this film. I had no doubt heard her voice in some of her more famous recordings—without knowing that I did—but I could never have identified her in a line-up. A multiple choice test question involving her name would have ended in random conjecture, pure and simple. This is not because I am horribly ignorant of French culture—I am not. But I am much more conversant with the likes of Charles Baudelaire, Guy de Maupassant, Alain, Jean-Dominique de la Rochefoucauld, and Maurice Blanchot than I am with the performing artists of France. Sure I know who Gérard Depardieu is—I've watched plenty of French films (and, yes, he plays a role in this one, too)—but popular singers are not a part of my cultural ken. To those who scoff, I can only defy: name me one popular singer from Bombay in the mid-twentieth century. That should suffice. I am assuming most charitably, as I can only do, that the people who put together La vie en rose were competent and did their historical homework before floating what would become known as the true story of Edith Piaf's life by countless moviegoers not so different in their abject ignorance from me. Should the producers have failed in some way, we may rest assured that some graduate student somewhere will be writing a doctoral dissertation on the topic, to be turned eventually into a book which nearly no one will ever read. I glanced over a few of the negative reviews (always the best...) at imdb.com, and sure enough it appears that key chapters of this woman's story were glossed over or left out, above all, the untimely death of her only child, to which a brief and inscrutable allusion is made, but no one who has not read either a biography of Edith Piaf or her autobiography is going to understand what it meant. Somewhat ironically, I selected this film to review at the salon de parfum because of its name, La vie en rose. It turns out that there are not very many films in existence with the words perfume or scent in them, so I decided to cast my net a bit wider and check out all films featuring the names of flowers as well. Who would deny that women have every business in the world smelling like flowers? I ask most sincerely. By strange coincidence (not...), this film was originally titled La Môme, “little sparrow”, which happens to be the name of a perfume from the house of Balmain which I happen to own. I did not know any of this, however, when I checked the film out. I chose it for the rose idiom, no more and no less. I soon discovered that this film has next to nothing to do with perfume—at least not on its surface. Yet the naming of the film was not at all coincidental, albeit not at all for the obvious reason. La vie en rose and La Môme serve, remarkably enough, as an apt introduction to a topic dear to me: the profound philosophical significance of perfume. Let me here baldly state (comme d'habitude) that I truly believe that the art hounds, so to speak, are barking up the wrong tree. But before I can explain this, my latest act of flagrant sacrilege, let us consider the film in its own right and on its own merits. Eventually where this is all leading will become clear. Born into poverty to street-performer parents—the mother, a singer; the father, a contortionist—Edith Piaf spent her childhood and adolescence scrounging about, simply attempting to scrape together enough money to be able to eat and have a roof under which to sleep. La Vie en Rose presents a few key episodes of this period which succeed in conveying the trials and tribulations of a person who for the most part missed out on childhood, being bounced as she was from one place to another and never able to develop meaningful long-term relationships with either of her parents or most other people, for a variety of different circumstantial reasons. The young girl is initially depicted living with her alcoholic mother in the most wretched of circumstances, and is wrenched away by her father, now working as a circus player, who transfers Edith to the care of her grandmother. Out of the frying pan, into the fire, it seems initially, at least upon Edith's arrival. Far from reflecting the classic stereotype, Edith's grandmother is the madame of a brothel. The worst that one might have expected does not, however, transpire—at least not in the film. Instead, the child is adored by a couple of the house prostitutes, who essentially adopt her as their daughter. She is shown during this portion of her life enjoying such things as singing songs and taking baths, and the happiness which she brings to the otherwise wretched existence of the prostitutes is patent. During this same period, while still quite young, Edith suffers a serious eye infection which the doctor fears might leave her permanently blind. Eventually, however, she recovers. 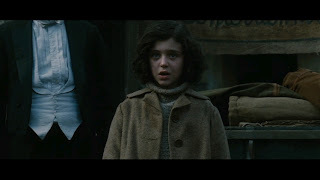 Throughout the film she is shown praying to God for help, and this seems to have begun with one of the prostitutes, who prayed with the girl to Saint Teresa, imploring that Edith's eye sight be restored. A bit later, Edith's father retrieves her again and takes her along with him on the circus tour, but after he has a falling out with some of the other members of the troupe, he decides to go it alone as a solo artist performing in the streets and depending on the kindness of strangers to remunerate him for accomplishing such feats as wrapping his legs around his head. One night the crowd clamors for an act by Edith, whose role up until then has been to pass the hat for collections. In order to ensure that the spectators will chip in, Edith's father pushes her to perform. At a loss as to what to do, she sings an impressive rendition of La Marseillaise, beloved to all good republican French people. (Not, however, to old-school monarchists.) The people like what they see and hear, and this constitutes the beginning of Edith's storied singing career. By the time she is twenty years old, Edith has taken up with a variety of sordid sorts and seems to be something of a lush. Her best friend—who I have since learned was her half-sister, what is never made clear in the film—seems even worse and could be used to define the term riff-raff by ostension. One day Edith is singing outside in what looks to be the 16eme arrondissement, while her side-kick solicits donations from passers-by. Purely by chance, the singer is discovered by Louis Leplée (played by the inimitable Gérard Depardieu), an impresario who takes the singer under his wing and begins having her perform at his cabaret, to great acclaim. He introduces Edith to his colleagues and audiences as un diamant brut, a diamond in the rough, which seems equally true of him. Depardieu is the perfect actor for this role, given his own past. But that's another story. No good deed goes unpunished, and Edith's new manager is murdered by some of her former associates, who appear to have been a part of an extortionist ring taking a portion of everyone in the neighborhood's money on pain of misfortune or worse for refusing to comply with the law of the jungle which they have laid down. Incensed by the fact that Edith has achieved a modicum of independence from them, they appear to have killed her manager, to everyone's horror. (The crime was never formally solved.) Because she knows the prime suspects, the singer becomes an object of scrutiny as possibly complicit in the homicide. For some time thereafter, Edith suffers ignominy, having been blamed by the people and the press alike for the murder, though in reality she had nothing to do with the death and would have been the last person to want to see her guardian angel's demise. Eventually Edith hooks up with a singing instructor, Raymond Asso, who had approached her early on in her nightclub adventure. He had given her his card, indicating that she should call him when she was “ready”. Given the way in which they interact with one another in the film, Edith appears to have been romantically involved with this man. As her voice teacher, he seems rather psychologically abusive, but he does have good intentions and in fact succeeds in transforming this diamant brut into a world class performer. With this polishing of her natural talent, Edith's fame and fortune skyrocket, leading her to be a French national heroine of sorts, and she travels to America to reach ever more people and critics. Initially the American press does not appear to appreciate Edith's gifts, but after a front-page New York Times review gushing with praise from one of the nation's most well-regarded critics, she becomes famous also in the United States. It is at the height of her glory that Edith meets and falls in love with Marcel Cerdan, a professional boxer from Morocco who, too, has become famous in America for his feats—another performer of sorts. He is married but this does not keep the madly passionate couple apart, although he travels back and forth from his farm and family in Morocco to New York City, where he spars in the ring with other great boxers, meeting with Edith to celebrate his victories in between. There seems to be a somewhat moralistic point to this next part of the story, at least as it is relayed in this film, but that is to read significance into what on its face was a simple historical fortuity. While flying back to New York City to be with Edith, who had summoned him, the boxer's plane crashes, thus abruptly terminating the ill-fated affair and leaving the devastated Edith in a state of total despair. She appears in the film always to have been a heavy drinker, but now she turns to drugs to assuage her ailing soul. This is, at any rate, how it looks in the film. When asked by a doctor why she has been plying herself with drugs, she speaks of "the accident", which can be interpreted as a reference to her lover's plane crash. From a fact-finding mission, I learned that two very severe car accidents were the real reason why Edith became addicted to morphine, which was provided to her while she was convalescing under a physician's care in the hospital. Once physically healed, she continued to use the drug, eventually becoming hopelessly addicted. She appears also to have been a chain smoker, although this fact is omitted from the film. Eventually her drug addiction takes its toll on her health, and five years down the line, she and the man who is now her husband seek professional help. Inspired by a soldier leaving to the battle front who has written a song for her, Je ne regrette rien, Edith manages to pull herself together for another grand performance after what has been a long and grueling hiatus. The bulk of this film ends up being a fairly harsh condemnation of drug use, although it manages to paint Edith in a sympathetic light, as a mere victim of tragic loss compounded by a difficult life, who has turned to drugs in order to be able to continue to survive. But nothing costs nothing, and her years of drug and alcohol abuse eventually lead to Edith's premature death at the age of 48, succumbing finally to liver cancer. I do have a few gripes with minor aspects, such as the performance by one of the early time slices of Edith. The girl who first sang in the street at her father's insistence seemed much more intelligent and pensive than all of the other Ediths throughout the film, so I question casting in that case, but all in all, this film is worth watching, albeit rather disturbing at times. What it is not at all is a view of life through rose-colored lenses, as the title implies. Instead, La vie en rose is an inexorable reiteration of how fragile people are, and how important fortuna is to our lives. A few scenes of this film show Edith Piaf applying make-up or sitting in front of a mirror, and some unidentifiable (by me, at least) perfume bottles can be seen on her vanity tray. But never is she seen applying perfume, nor does she or anyone else make any mention of the stuff. I freely admit, therefore, that it is not immediately obvious why this film should be relevant to perfume. Key words: immediately obvious. In fact, the story of Edith Piaf's life is eminently relevant to perfume, on two distinct levels. First, on the literal level mentioned above, it turns out that the house of Pierre Balmain launched a perfume in honor of Edith Piaf: La Môme, which was the moniker conferred upon the singer by the man (Louis Leplée) who first discovered her while she was still singing in the streets for people's small change. I owned this perfume long before having learned for whom it was composed. 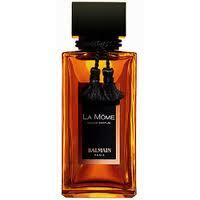 I added it to my collection because I am an admirer of nearly every perfume launched by Balmain. I have been consistently amazed by the quality, especially relative to the cost. A clear indication that designers continue to regard their fragrances as accessories of sorts—perhaps even lowly toiletries!—is that Pierre Balmain perfumes cost about as much as a button on one of the design house's shirts. I kid you not. Interestingly enough, unlike Jolie Madame, Balmain, Miss Balmain, Monsieur Balmain, Ivoire, and Ambre Gris, La Môme never seems to have garnered a very big following. I believe that the launch was limited edition and timed to coincide with the film (also in 2007), so that may be part of the explanation. Still, there is something strangely elusive and inaccessible about the composition, reminiscent of Edith's voice teacher's stern yet sincere admonishments—one translated example: how can someone so talented be so dense? Despite such borderline cruelty, there is something likeable about the man, and the same can perhaps be said of the perfume, La Môme. What is the perfume La Môme like? Well, it's mercurial. Sometimes it seems sophisticated and majestic; at others it seems confusing and imbalanced. In this way, the perfume amazingly captures the essence of Edith Piaf, whose diminutive size (only 4'8” at full adult height—which leads one to suspect that her mother's alcoholism may have stunted her child's growth) is completely contradicted by the volume of her voice. Her passion in singing is fueled of course by the emotional tragedies which she has suffered but managed to endure. In the end, however, Edith Piaf falls prey to forces greater than herself. This leads to the second, more philosophical, significance of La Môme: perfumes are every bit as fragile—and mortal—as persons. They change over time due to extrinsic factors over which they—and their loved ones and admirers—have absolutely no control. They may enjoy a relative degree of fame, which may look, in the moment, like immortality, but in the end, it is not. Persons and perfumes do not endure the test of time. They are, indeed, intrinsically ephemeral. Death is the great equalizer of persons and perfumes alike. Moreover, no matter how much we may wish to believe that contemporaneous success bodes well for long-term renown, the reality is quite different. The magnitude of the contemporary success of a particular person—his or her celebrity—would seem indeed to be inversely proportional to the prospects for long-term appreciation of who he or she once was. Why is this? Let us reflect upon this idea for a moment. In order for some person or thing to be widely acclaimed within their own lifetime, they must, by definition, be accessible to the masses. Everyone loves their society's currently reigning celebrities, but what have they really done? They have entertained their contemporaries. As irreverent as this may seem, I believe precisely the same to be true of best-selling books and best-selling perfumes as is true of the “it” girl or guy of the day. These people, and those words, and those scents, will fade away. Why? Because the basis of their popularity impugns their claim to true greatness. Yes, relative to society today, as it happens now to be, we can identify certain persons as celebrities, but if, as often seems to be the case, they spend more time on self-promotion than on the creation of lasting works, then this will be revealed upon their deaths. No one is going to be around to promote dead people whose ambition vastly exceeded their talent. Far more importantly, this concern with contemporaneous fame tends to impede whatever ability a celebrity may—or may not—have to produce works which might be able to live on once they are long gone. The problem for perfumes is that they are even worse off in this regard than are persons. Perfumes have a finite lifespan dependent not upon their quality or their worthiness to survive, but on the kindness of strangers, so to speak. Nothing can save a perfume which was launched by a house taken over by a corporation whose guiding telos is profit. But since corporations are essentially profit-seeking entities, the best corporations, by definition, are the ones which pursue profit most assiduously, rejecting any other measure of value. I do not mean to suggest by saying all of this that Edith Piaf was not a remarkable woman. She was. It is nothing short of miraculous that she managed to make anything of her life, given the conditions into which she was born. She also managed to conquer her own fairly serious stage fright. Still, no one can reasonably deny that much of her eventual success was due to sheer luck. How many great musicians are there inhabiting the tenements of sprawling urban centers in the third world? We will never know because they will never break out of the conditions which bind them as if by chains. This is not to say that now and then someone will not beat all of the odds, but fate comes back in the end to take back all which it seems to have given to a soul such as Edith Piaf, may she rest in peace. La vie en rose is the portrait of a woman who refuses to give up and who exudes an enthusiasm and joie de vivre which made her and continue to make her an inspiration for all those fortunate enough to become aware of her story. Most people in the world, however, are unaware of the identity of even wildly popular persons who lived in the past. Why? Because they are now dead, and as time passes, celebrity, too, will eventually evaporate away, just like perfume. Like persons, the vast majority of perfumes which ever existed have slipped away into anonymity. They were beautiful while they lasted, and they had their fans no doubt, but to most modern people, it's as though they never existed. That is precisely how it should be, it seems to me, because perfumes are inherently, intrinsically, ephemeral creations, just like human beings. We may attempt to erect effigies in their honor, but they will be but false idols, incapable of capturing what once was a complex, subjective, and equally ephemeral reception by persons who happened to exist at the time and be situated so as to be able to appreciate what became their beloved perfumes. I believe you have struck me speechless. I'm going to go do some mulling & come back and read this again soon.